For many, the fact that there is no bootloader unlocking tool for the AT&T HTC One X has been a deal breaker. Rooting is a big part of the Android experience, so why get a phone that will limit you from all the fun? Well, thanks to the incredibly talented folks at XDA-Developers, that is no longer the case. There is now a permanent rooting solution for the HTC One X on AT&T and Rogers. The one-click rooting process is super simple and only takes six steps to complete! If you haven’t considered rooting your Android phone before, this easy process and countless benefits may change your mind. However, as Android Authority points out, this method of rooting your HTC One X will show a “tampered” flag on the handset’s hboot. This may void your warranty and we’re not sure if there is currently any way to remove the tampered flag. So, as always, only proceed if you accept the risks. With that being said, this method is very easy and takes only a few minutes to complete, but it may take inexperienced users a bit longer. 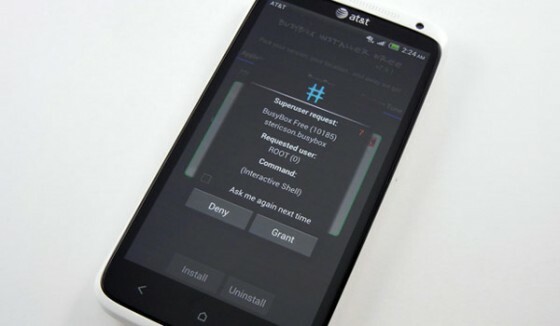 Here is the full step-by-step guide on how to complete the root (via kennethpenn of XDA-Developers). This will root your One X, install Busybox, and install the SuperSU application for rights management. Download and install the HTC mobile phone drivers (Windows). Make sure to let us know how it goes for you in the comments section below! Also head over to XDA-Developers for more info and details on the root process if needed. Enjoy! Should be thoroughly tested before posted. Number of mac users having no luck. Yeah my one x didn’t root either, maybe its for a kernal we don’t have yet! My HTC One X (EU) reboot several times but still NOT rooted. Don’t waste your time with this poorly tested script. Works fine for me! super user installed as well. I do that and my one x reboot all the time !!! what should i do help pleeease ? uhm. you should probably put links to the download. like really.